Over/Under: Over 142.0 at 1.90 Bet Now! Third plays fifth in this game and with only a point between the two teams, there is definitely all to play for. Whoever wins this game will be ahead of their opponent and they’ll also have the head to head record sewn up, which means that this game has a lot riding on it. Of course, this is partly down to the nature of these group tournaments and the way fixtures pan out. The French are big favourites to deal with Venezuela and when you look at the final fixtures, France play China and Venezuela play USA, even an upset in this game is likely to be turned around in the final game which means that France should be ahead of their opponents. It shouldn’t come to that though as France will be flying after their huge win against Serbia. A 75-76 win is always going to lift your spirits and once again Nando De Colo was in excellent form, offering 22 points in the crucial win. For Venezuela, a four-point victory over China brought a lot of joy and Néstor Colmenares was the star player with 16 points. It would be a tall order to expect Venezuela to do the same again but at least they’ll come into this game with a spring in their step. 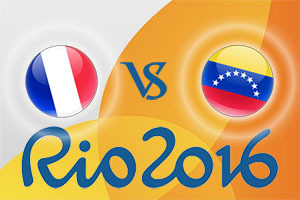 With France at -20.0 at odds of 1.90, you should be looking to back them convincingly in this game. There is the Over/Under market to consider and you should be looking to go OVER 142.0 which you can find available at odds of 1.90. Bet Now! The half-time, full-time bet of France, France is available at odds of 1.13 so there isn’t a lot of value to be found in the Prop bets for this game. Given the run of form Nando De Colo has been in of late, you should definitely back him to score over 15.5 points, which is on offer at odds of 1.84. For Venezuela, look to Gregory Echenique to grab over 11.5 points, which is available at odds of 2.20. The game starts at 0230 BST on Saturday 13th of August.